The core of the program's feature set consists of three main tasks, which are prompted via a wizard upon start-up: writing data CDs and DVDs, creating CDs for audio playback, and ripping music from CDs or editing ID3 tags. Canceling the wizard results in a rather blank blue screen with only a few selections in the toolbar. In order to work on a new project, you'll need to select one of the options, which can be brought back via the "New document" icon in the upper left. Unfortunately, you can't even open an existing project without selecting one of the wizard options first. bin/nrg ? ISO converter, simple cover printing and much more! 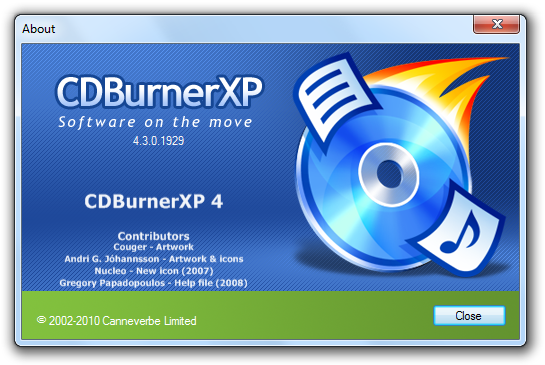 All CDBurnerXP reviews, submitted ratings and written comments become the sole property of Windows 7 download. You acknowledge that you, not windows7download, are responsible for the contents of your submission. However, windows7download reserves the right to remove or refuse to post any submission for any reason. 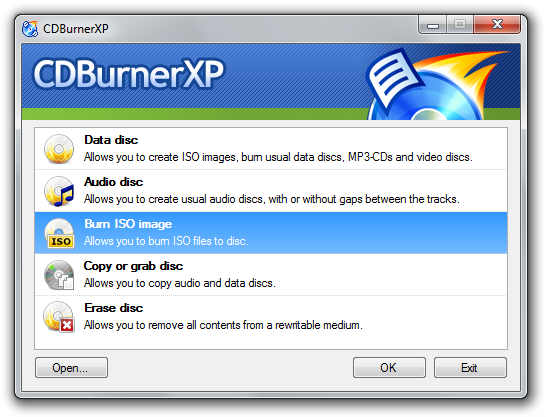 Windows 7 Download periodically updates pricing and software information of CDBurnerXP full version from the publisher, but some information may be out-of-date. You should confirm all information. Using warez version, crack, warez passwords, patches, serial numbers, registration codes, key generator, pirate key, keymaker or keygen for CDBurnerXP license key is illegal and prevent future development of CDBurnerXP. Download links are directly from our mirrors or publisher's website, CDBurnerXP torrent or shared files from free file sharing and free upload services, including Rapidshare, MegaUpload, YouSendIt, SendSpace, DepositFiles, DivShare, HellShare, HotFile, FileServe or MediaFire, are not used.